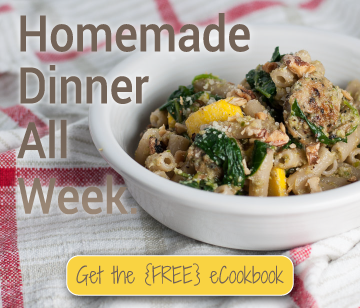 In my perfect world, everyone would love to cook and have all the resources they needed–time, money, access to the best ingredients–to prepare an adventurous, yummy, homemade dinner for their family every night. No hangry fights, no working late, no obstacles. That’s far from reality, though. Many of us do our best to sit down as a family for a meal together every night, which is the important thing, but maybe the food isn’t always…ideal. Besides getting dinner on the table, we have other priorities–hobbies, playing with the kids, sports. Cooking is my hobby, so I tend to make time for three hours of preparing dinner if that’s what I want to do, and it often is. I don’t want to sacrifice my love for the cooking process in my recipes, and I know that they’re frequently a little too involved for weeknight family dinners, but I do want to give you more options for wholesome, homemade, to-die-for dinners without lengthy ingredient lists or an hour and a half of prep time. My mom casually mentioned these mushrooms to me when she made them for herself and my dad a couple weeks ago. Right after they finished a full day of work and a two hour bike ride. Obviously a perfect candidate for a busy weeknight dinner–impressive, but possible to throw together without a ton of fuss. In the process of doing two photo shoots with these melts, I was also surprised to learn that they reheat extremely well in the oven, even after being completely prepared and cooked once. So that adds the option of making them in advance (if doing so next time, I’ll wait to add the cheese until the day I eat them). I was tempted to add some, shall we say, “flair”, to the recipe Mom emailed me, but I resisted the urge so you all would be more likely to try them amidst any back-to-school chaos. Because they. are. yummy. 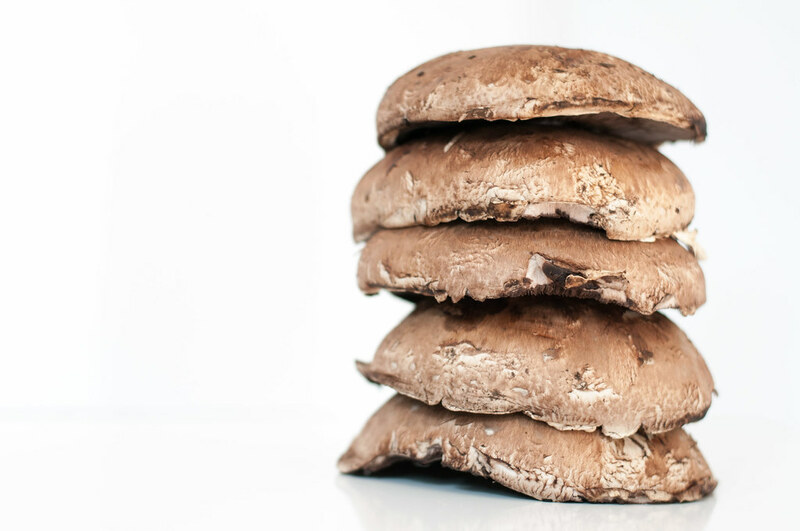 A meaty mushroom base that’s honestly more akin to a perfectly cooked and seasoned steak than a boring old hamburger bun. 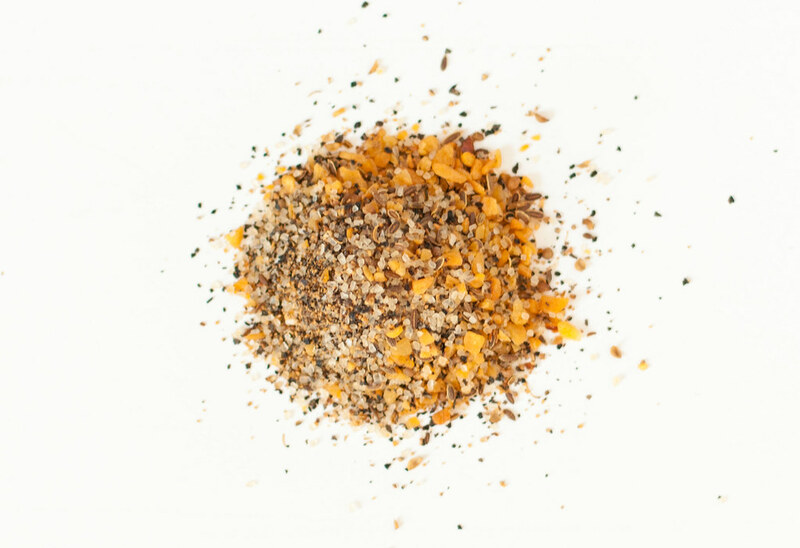 I prefer not to use pre-mixed spices, but I decided to keep the grill seasoning here to shorten the ingredient list (and because I had some on hand!). You could easily substitute a mixture of your favorite spices that you do have around if you don’t have grill seasoning, instead of spending the money to cause even more overcrowding in your spice cabinet or drawer (mine has begun to invade the oil and vinegar shelf). 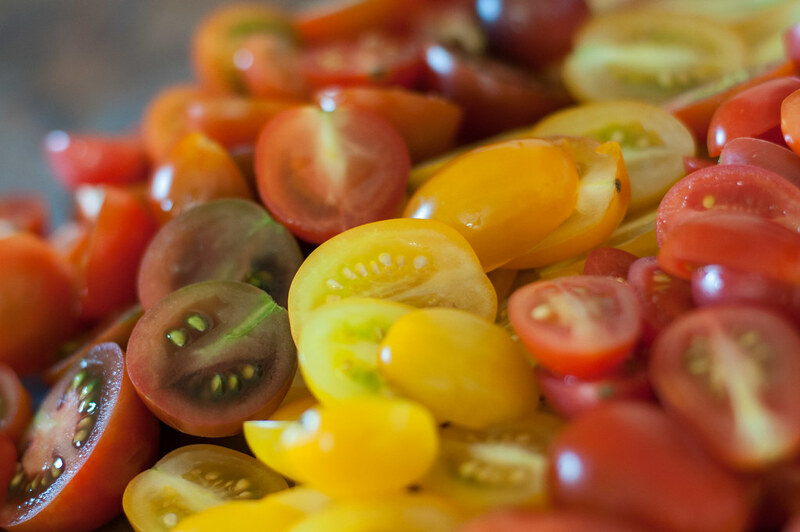 While the mushrooms “marinate” you have time to chop up some baby tomatoes and…oh wait, that’s the only other real prep involved! I used grated fontina because I had it, and it melted and browned gorgeously, but you’ll hardly miss anything if you just get deli slices of Swiss or Provolone. I would only advise against a super salty cheese (e.g., cheddar), because there’s a lot of flavor things already going on with the mushrooms. What if you don’t have a grill?! It’s okay, neither do I. I used the grill pan, but if you don’t want to mess with the combination of grill pan and broiler, see my recommendation after the recipe for making these entirely in the oven. These are more filling than you might anticipate, but if you’re feeding a very hungry crowd, serve with a bean salad, rice, or lentils. Combine the vinegar, soy sauce, 3 T olive oil, rosemary, grill seasoning, onion, and garlic in a pourable measuring cup or bowl. Allow to stand while you wipe the dirt off the mushrooms and place them in a large baking dish. Slowly pour marinade over the mushrooms, getting some on each cap. 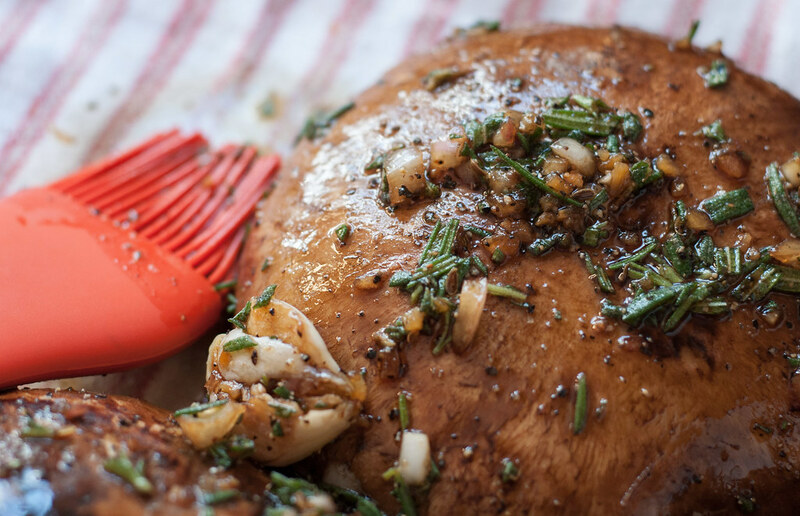 Let marinate at room temperature for 30 to 90 minutes, occasionally spooning or brushing more marinade over mushrooms. While the mushrooms marinate, wash and halve the baby tomatoes. If you’re really short on time, it won’t hurt to leave them whole (they’ll just require a bit more cutting to eat). Just before the mushrooms are done marinating, heat 1 t oil over medium heat in a skillet, then add tomatoes and saute until just softened, no more than 2 minutes. Add the spinach and cook until wilted, then immediately remove from heat and drain off excess liquid (I drained in a colander then returned to the pan). Sprinkle with salt and pepper. Heat grill or grill pan to medium. If using a grill pan, also preheat oven broiler. 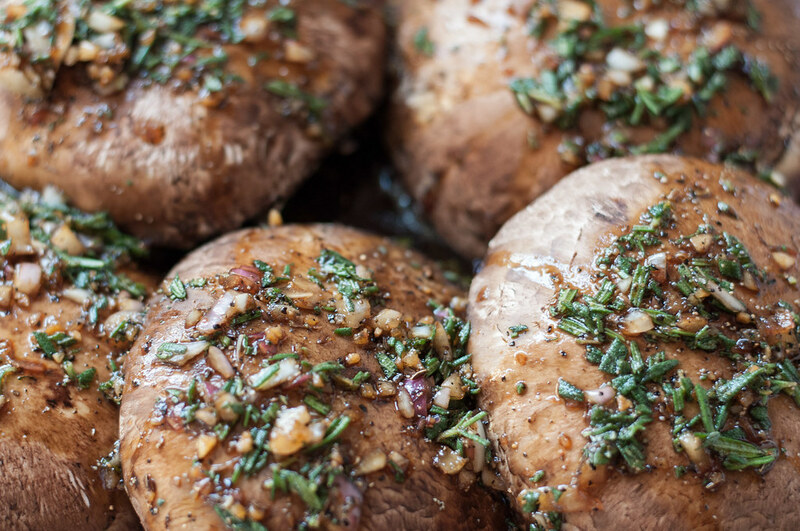 Remove mushrooms from marinade, brushing off seasonings, and place gill side down on grill pan for 5 minutes. They may stick a little but should release easily with a rubber spatula. Turn over, carefully distribute vegetable filling evenly amongst mushroom caps using a tongs, and top with cheese. Grill for another 5 minutes, closing grill lid to melt the cheese. 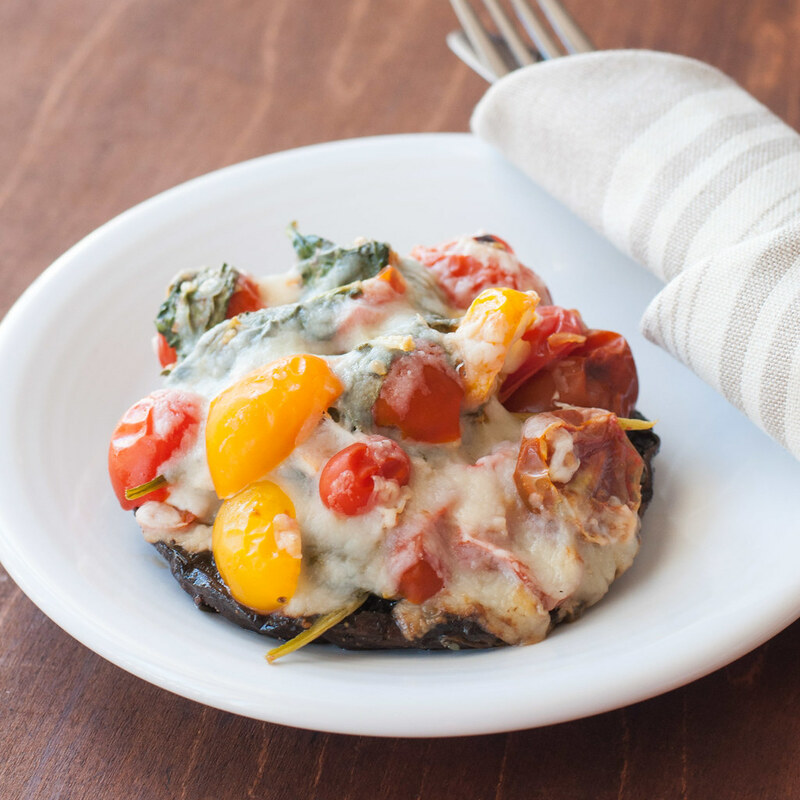 If using a grill pan, heat mushrooms under broiler for two minutes (on a baking sheet) to melt and brown the cheese. 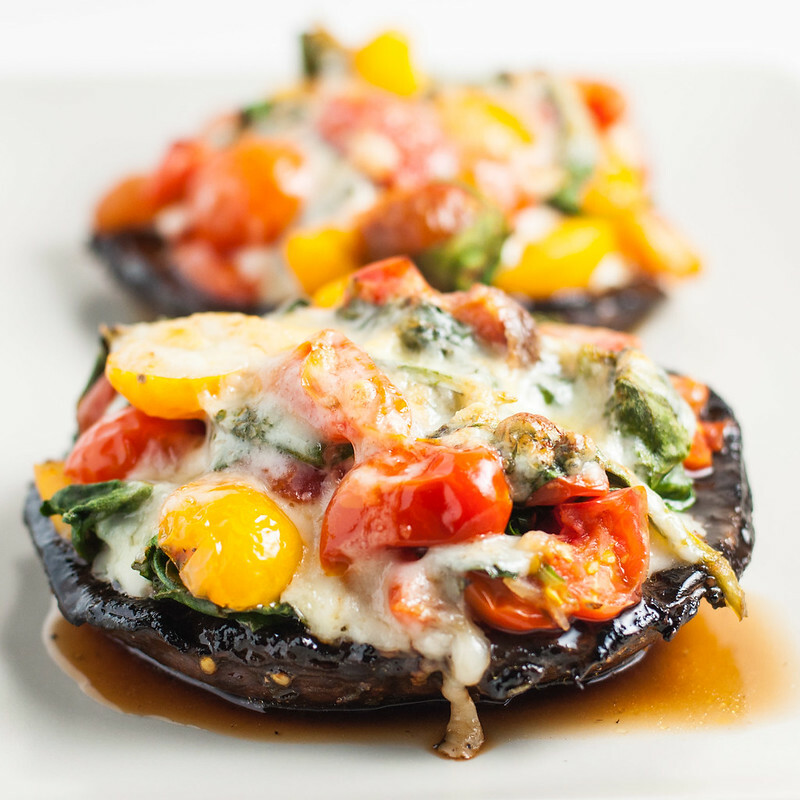 Serve mushrooms with more balsamic vinegar and pepper. Oven-only method: Instead of heating the grill and the oven, heat only the oven to 450 degrees (not to broil) and position the rack in the top third of the oven. Line a baking sheet with foil and place the mushrooms gill side down after wiping off the excess marinade. If you have a wire race or broiler pan, use that so excess moisture drips off the mushrooms. Cook for 5 minutes. Remove from oven, carefully turn to face up, then fill with the spinach and tomato mixture and top with cheese. Return to oven for another 5 to 8 minutes, or until cheese is melted and beginning to brown. 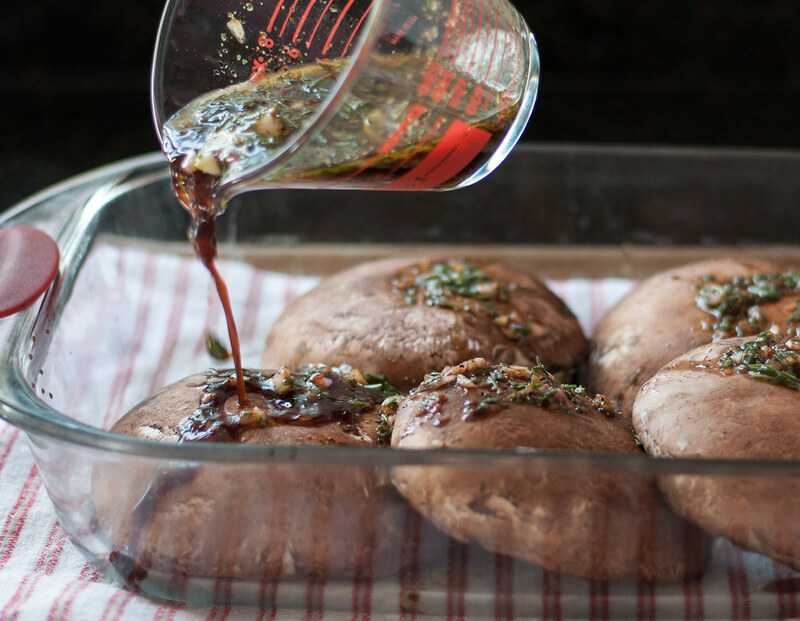 The easiest way to handle the filled mushrooms is with a spatula underneath and a tongs to hold the sides steady. 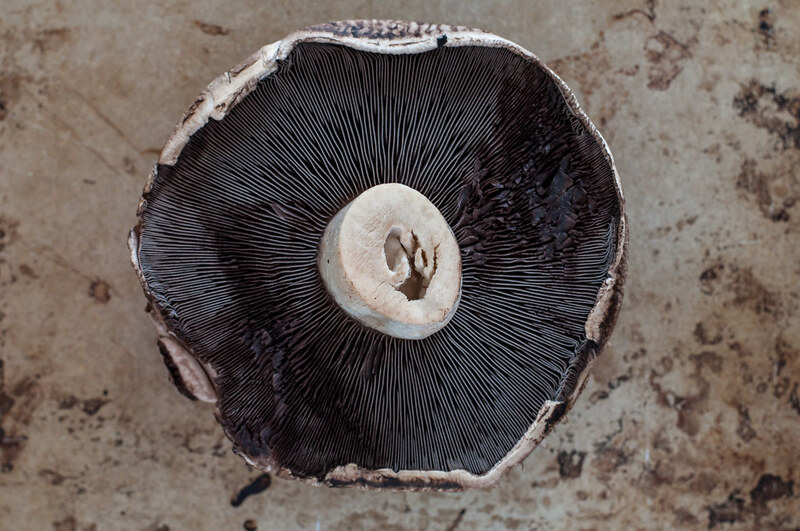 Portobello caps are often less expensive when purchased by the pound than when purchased pre-packaged. Tessa, I am in love with this recipe! MUSHROOM LOVERS UNITE. Tessa this recipe is making me all hungry!!! Definitely trying this asap!! Thanks Ami, enjoy! 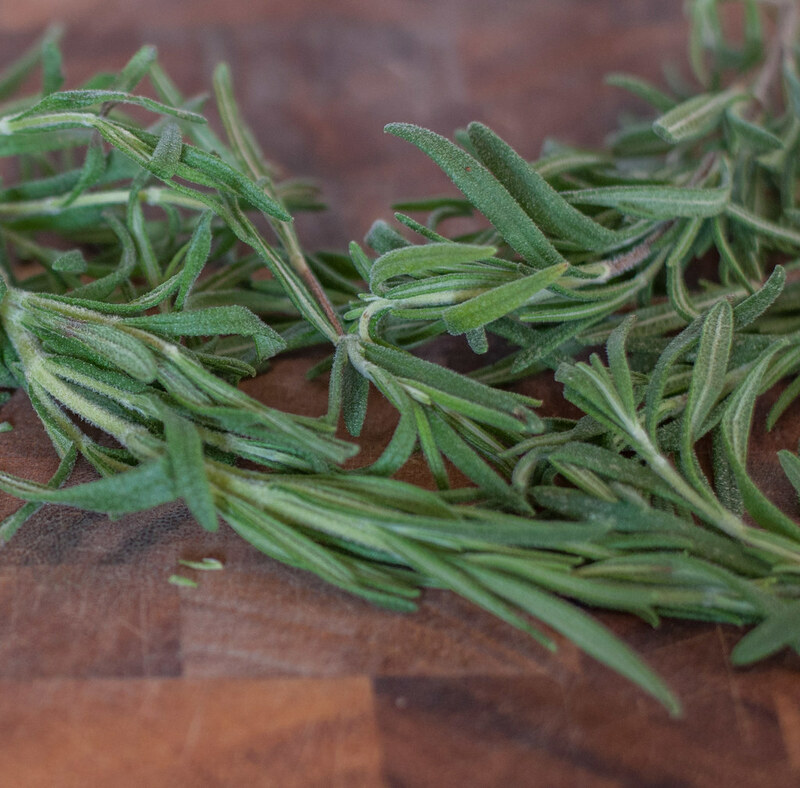 I love this recipe because I often forget that simple cooking can be super yummy!